He looks pretty suave doesn't he? Got a good lean on. 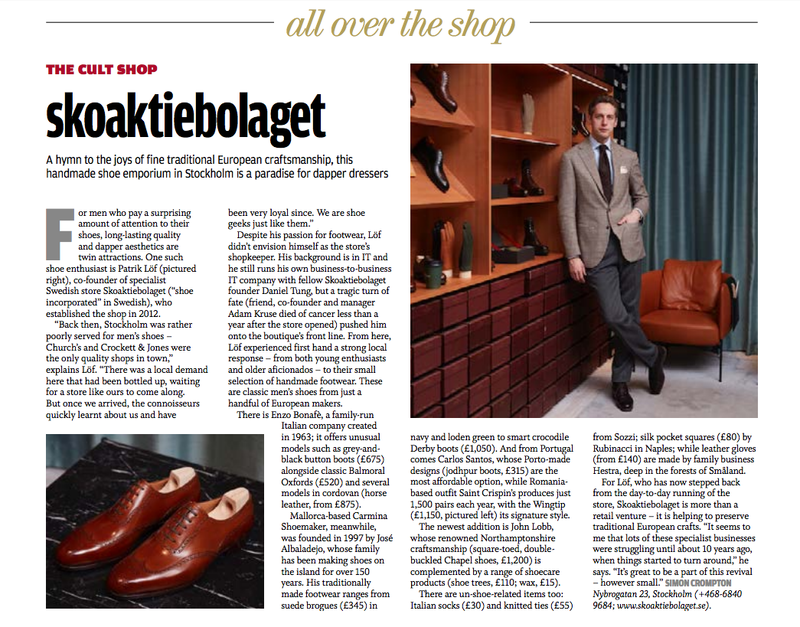 Patrick at Swedish shoe shop Skoaktiebolaget recently posed for an article of mine, above, in How To Spend It magazine. (A supplement of the Financial Times, and arguably the top luxury publication in the UK). I've reproduced the piece below, for those that don't want to squint at the image. 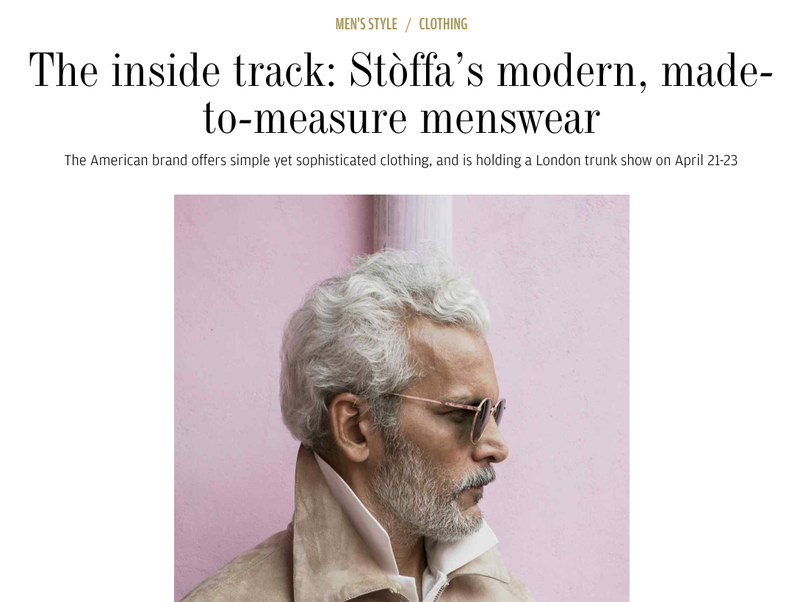 It was followed last week by a piece on the How To Spend It website profiling Stòffa - the super-stylish trunk show-based brand run by Agyesh Madan. I covered Stòffa in more depth a couple of weeks ago on Permanent Style. It's really nice to bring brands such as these to a wider, mainstream audience. As much as hyper-engaged, enthusiastic early adopters provide a foundation for a brand, it's only broader awareness that ensures their future. For men who pay a surprising amount of attention to their shoes, long-lasting quality and dapper aesthetics are twin attractions. One such shoe enthusiast is Patrik Löf (pictured), co-founder of specialist Swedish store Skoaktiebolaget (“shoe incorporated” in Swedish), who established the shop in 2012. “Back then, Stockholm was rather poorly served for men’s shoes – Church’s and Crockett & Jones were the only quality shops in town,” explains Löf. “There was a local demand here that had been bottled up, waiting for a store like ours to come along. Despite his passion for footwear, Löf didn’t envision himself as the store’s shopkeeper. His background is in IT and he still runs his own business-to-business IT company with fellow Skoaktiebolaget founder Daniel Tung, but a tragic turn of fate (friend, co-founder and manager Adam Kruse died of cancer less than a year after the store opened) pushed him onto the boutique’s front line. From here, Löf experienced first hand a strong local response – from both young enthusiasts and older aficionados – to their small selection of handmade footwear. These are classic men’s shoes from just a handful of European makers. There is Enzo Bonafè, a family-run Italian company created in 1963; it offers unusual models such as grey-and- black button boots (£675) alongside classic Balmoral Oxfords (£520) and several models in cordovan (horse leather, from £875). Mallorca-based Carmina Shoemaker, meanwhile, was founded in 1997 by José Albaladejo, whose family has been making shoes on the island for over 150 years. His traditionally made footwear ranges from suede brogues (£345) in navy and loden green to smart crocodile Derby boots (£1,050). And from Portugal comes Carlos Santos, whose Porto-made designs (jodhpur boots, £315) are the most affordable option, while Romania- based outfit Saint Crispin’s produces just 1,500 pairs each year, with the Wingtip (£1,150, pictured) a signature style. The newest addition is John Lobb, whose renowned Northamptonshire craftsmanship (square-toed, double- buckled Chapel shoes, £1,200) is complemented by a range of shoecare products (shoe trees, £110; wax, £15). rom Sozzi; silk pocket squares (£80) by Rubinacci in Naples; while leather gloves (from £140) are made by family business Hestra, deep in the forests of Småland. Read the full article on Stòffa on the How To Spend It website here. Read my more in-depth piece on Permanent Style here. You can follow the discussion on Skoaktiebolaget and Stoffa in How To Spend It by entering your email address in the box below. You will then receive an email every time a new comment is added. These will also contain a link to a page where you can stop the alerts, and remove all of your related data from the site. Great stuff. Perhaps you should do a piece on Skomaker Dagestad in Oslo. It is run by an actual shoemaker and has been going strong for close to 30 years. EG, G&G and Saint Crispin is his specialty in addition to Frank Clegg leatherworks. Thanks for this report. These businesses are part of a new trend that really deserves being widely known and buttressed. As you note the future of today craftsmanship in the menswear industry is going to depend on their success. Obviously, there’s still a great deal of work to be done. As to Skoaktiebolaget , which I happen to know better thanks to the fact that they are based in Europe and to their dedication and astute use of social media, have definetly found their right place in the landscape and could thrive, though new ideas and options would be worth exploring. I’ve noticed that they don’t offer G&G’s and EG’s anymore. Is there any explanation you could share with us? Will we get your Stòffa review before they’re next in London, Simon? No, sorry. Have to pick mine up then! When sitting down in a double-breasted suit, which buttons do you unbutton, if any? Have you considered writing for publications like Gay Times or Attitude? Both publications are aimed mainly at men and could increase your audience (and income).